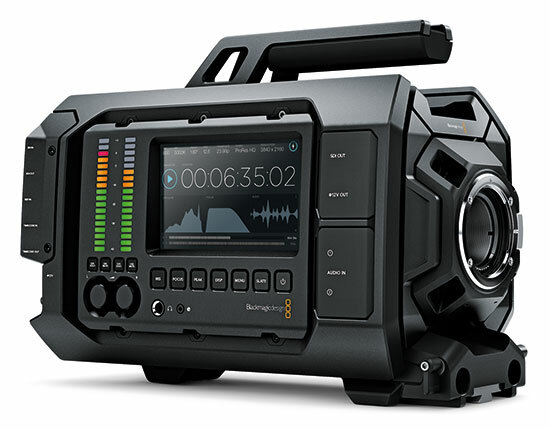 Introducing Blackmagic URSA! Built to handle the ergonomics of large film crews as well as single person use, URSA has everything built in, including a massive 10 inch fold out on set monitor, large user upgradeable Super 35 global shutter 4K image sensor, 12G-SDI and internal dual RAW and ProRes recorders. Because the sensor and lens mount assembly can be changed, you can choose EF or PL lens mounts, or even a broadcast video sensor with B4 mount. This means you can upgrade to the latest sensor technology in the future and keep your investment in the camera body! Blackmagic URSA is designed to be used on high end feature films, commercials, episodic television production, documentaries, electronic news gathering, music videos and more. When used on jobs with a large crew you can easily dress the camera with high quality cinema lenses, rails, follow focus, matte boxes and more. With built in scopes for exposure, focus and audio levels, it’s easy for DP’s to get perfect results every time. The dedicated screen for camera assistants lets them check and update camera parameters independently of the DP. If you’re shooting solo then the large fold out on set monitor, built in scopes and internal recorder means you don’t need any extra on set equipment because it’s all built into the camera. That’s a whole film set of equipment built into the one extremely portable design! 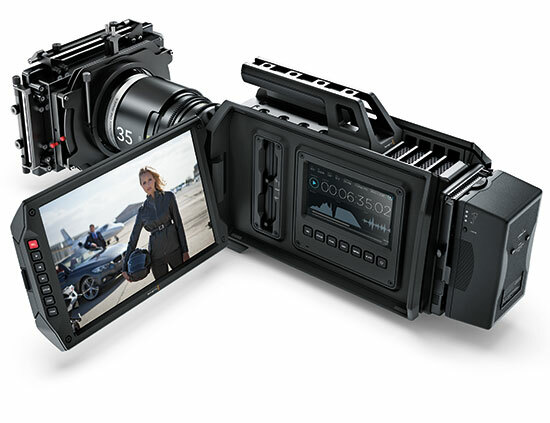 The Blackmagic URSA features a larger professional size that has the space for powerful cooling that allows higher frame rates while keeping the chassis cool and the fan super quiet. The machined aluminum design is incredibly strong and has been designed for large film crew use and to be field upgradable to new sensors by the user. Each area of the camera has been divided into separate DP, camera assistant and audio engineer work stations. The DP station features a large 10 inch fold out on set monitor and separate 5 inch screen for settings, camera status and scopes. The camera assist station features a separate screen for camera settings, status and scopes and an audio station features audio meters, controls and audio connections. The big screen means you don’t need extra on set equipment so it’s easy to move around quickly between shots. Simply fold in the monitor and go!